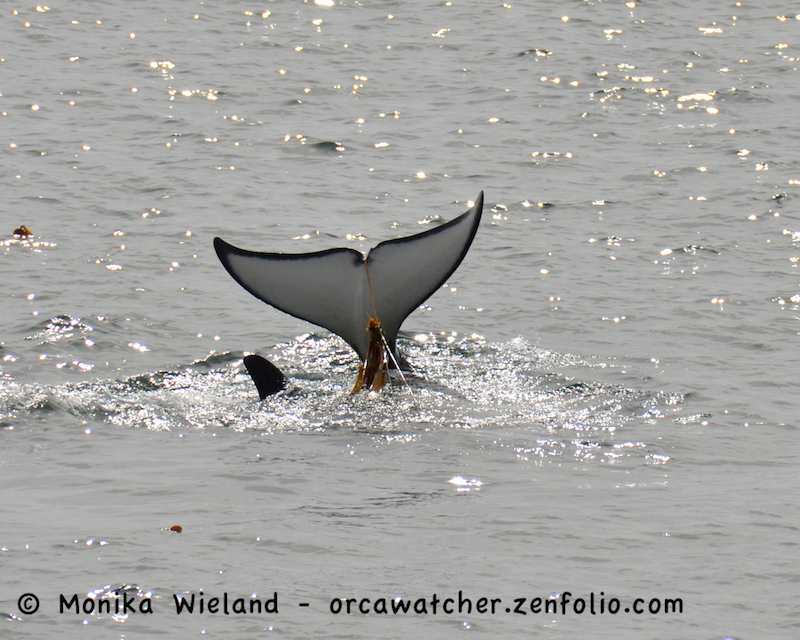 The amazing whale sightings have continued and I've been lucky to see them almost every day this week. 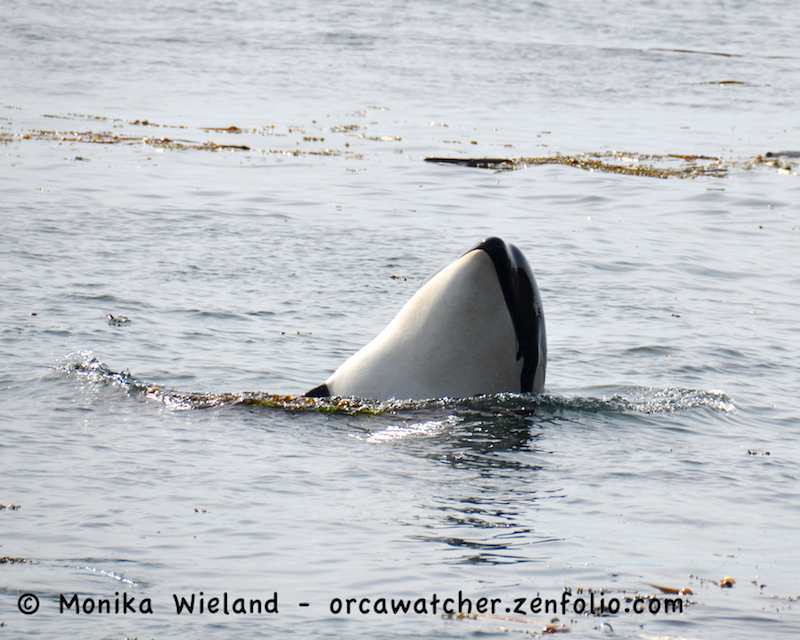 Already I've had more incredible shore-based whale encounters this season than I did all of last year combined, and it's still only early June and the whales came back late! Needless to say, it's shaping up to be quite the year and I can only hope it will continue. 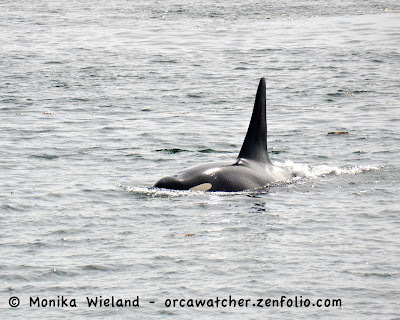 It may be a while, however, until Wednesday, June 5th's afternoon's encounter is topped. Word was whales were a few miles south of the south end of San Juan Island and that a large group of L-Pod whales had showed up to join J-Pod. In addition to the L12 sub-group (L22s, L11s, L25), present were the L26s (sadly sans L26), L53, L72s, L4s, and L47s. 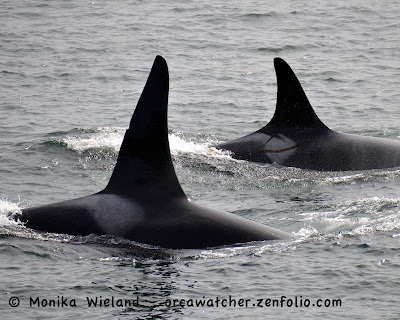 For those keeping track, the only whales absent from L-Pod were the L54s, L2s, and L84. Not knowing if they were ever going to head north, I settled in at Land Bank's Westside Preserve to wait. Two hours after arriving my waiting paid off! 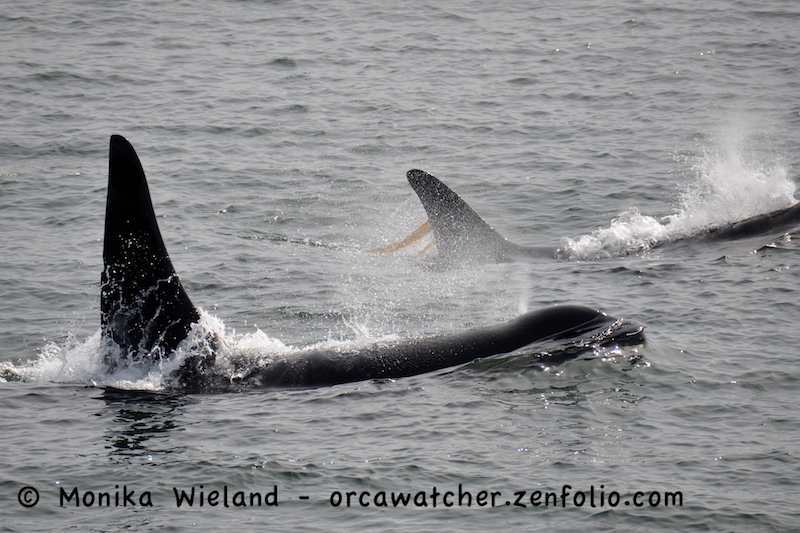 Not surprisingly, J2 Granny and J8 Spieden were in the lead. Not far behind them were J19 Shachi, J41 Eclipse, and L87 Onyx. The latter three came pretty close to shore, and were weaving back and forth right in front of Land Bank, seemingly indecisive about whether to continue north or head back south. 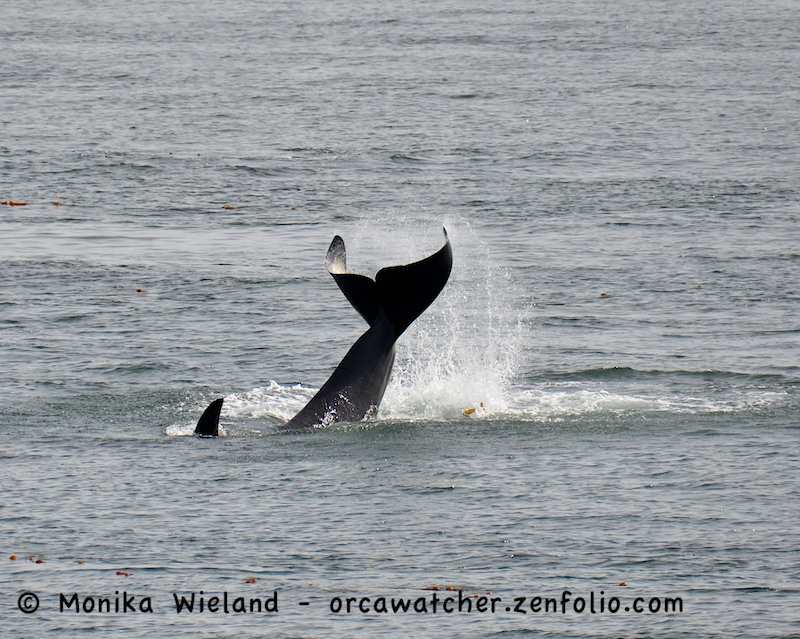 Mega's tall dorsal fin is always so impressive at close range! 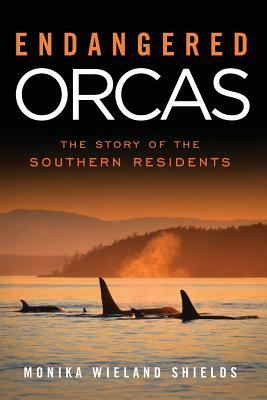 He's the oldest male among the Southern Residents and likely also the most successful breeding male. 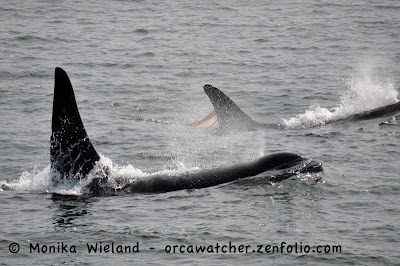 It's always interesting to see how the whales mix and match when pods get together, and Mega seemed rather interested in eight year-old J41 Eclipse. 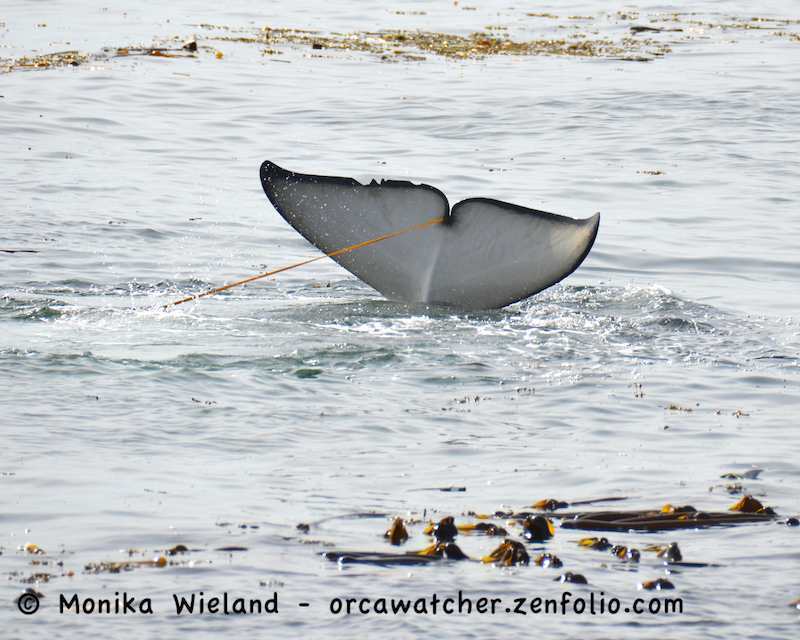 One of my very favorite whales, I told him she's a little too young yet!! Perhaps he was interested in J19 Shachi, who hasn't been seen with a newborn since Eclipse was born in 2005. 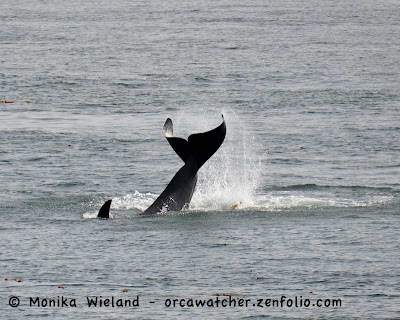 When going to the west side to watch whales it's always a bit of a debate whether to watch from Land Bank or Lime Kiln. 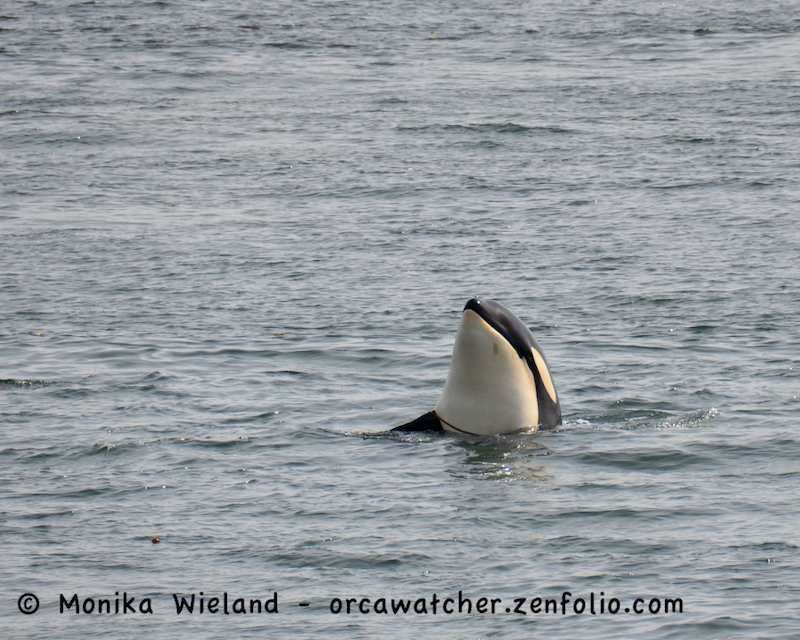 Us orca-holics are always anxious to pick the best spot where the whales will be closest, but of course one never knows for sure where that will be. On June 5, Land Bank was undoubtedly the place to be, as the whales kept going back and forth and back and forth right in front of us. 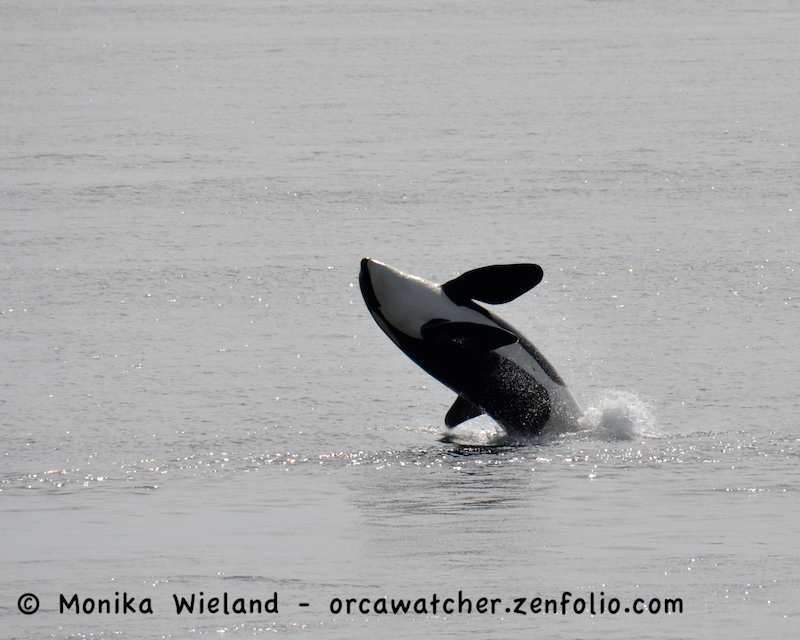 I can only imagine what it was like to sit at Lime Kiln (though I really know all to well) and watch the blows so close to shore off Land Bank heading towards you, only to see them turn around time and time again! I realized today that my Zenfolio site offers 5 x 15 prints, and that this size is actually really appropriate for killer whale shots, so I've tried cropping a few of them that way from this encounter. Check out the gallery of them and order prints here, starting at just $15. Click on the photos to see a larger version that does them more justice. At this point, Granny looped back and started tail slapping madly. Was she tired of waiting and calling all the whales to start coming north? Perhaps, or maybe she was just getting the party started, because we saw a lot of surface behavior after that! 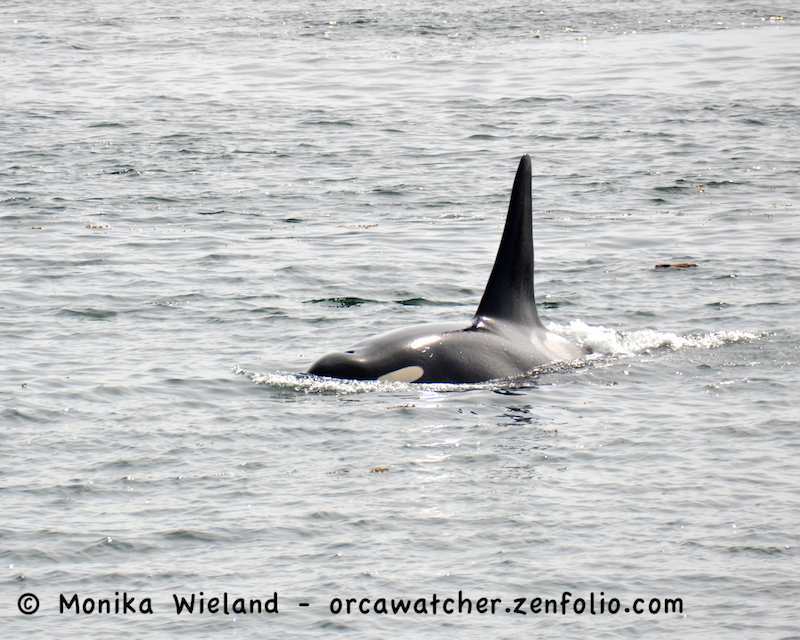 In recent years L53 Lulu, who no longer has any living immediate relatives, has spent the winter traveling with L-Pod and the summer traveling with J-Pod. 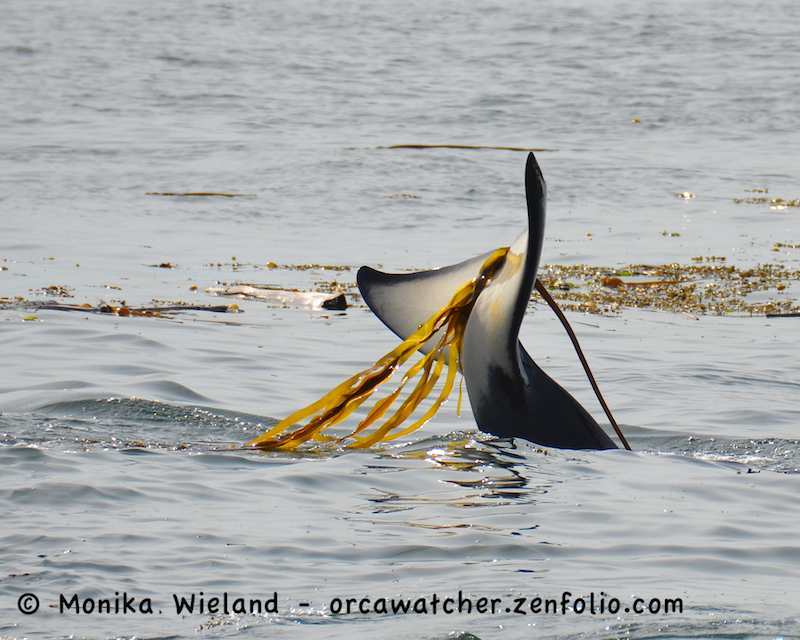 So far, she's stuck with L-Pod here in inland waters even when the two pods have split. 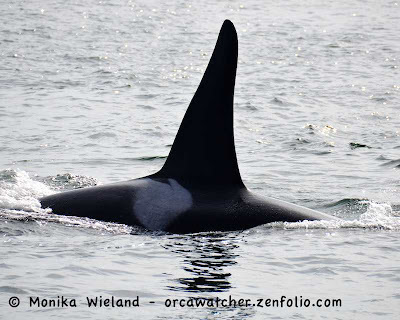 On this day, she was traveling with L95 Nigel and L90 Ballena. 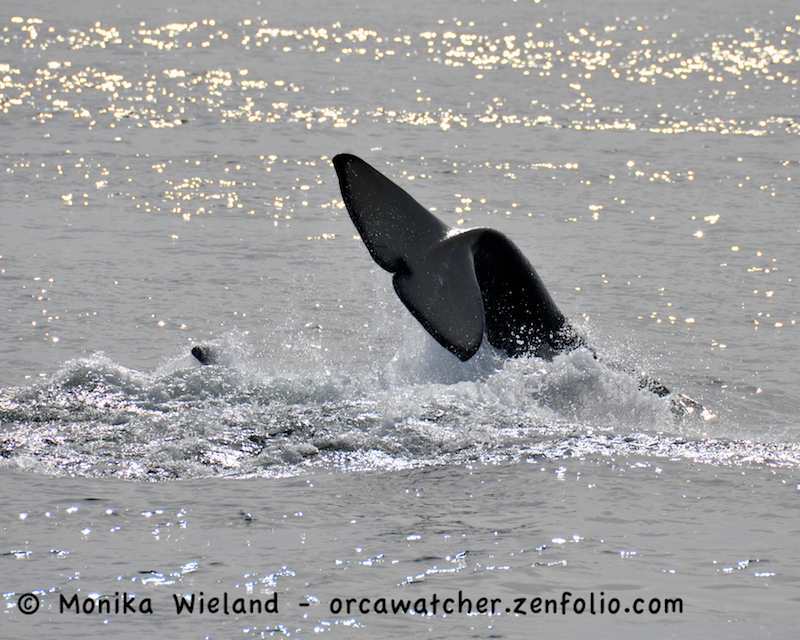 She's always been a whale known for breaching and this day was no exception as she launched herself out of the water three times in quick succession. This whale was doing an upside down tail slap when it got pushed by another whale beside it. There was a lot of rough-housing going on! J17 Princess Angeline and her four year-old son J44 Moby were traveling with L82 Kasatka and her three year-old son L116 Finn. The J17, with all their youngsters, have been hanging out with lots of different L-Pod youngsters, maybe giving their kid a chance to play with some cousins they haven't seen all winter! Wow, Monica, sounds and looks like a magnificent day with the whales! Thanks for sharing so many beautiful shots. So, so cool! I think I am going to have to order a print.